Tea parties are traditional get-togethers for conversation and enjoyment. 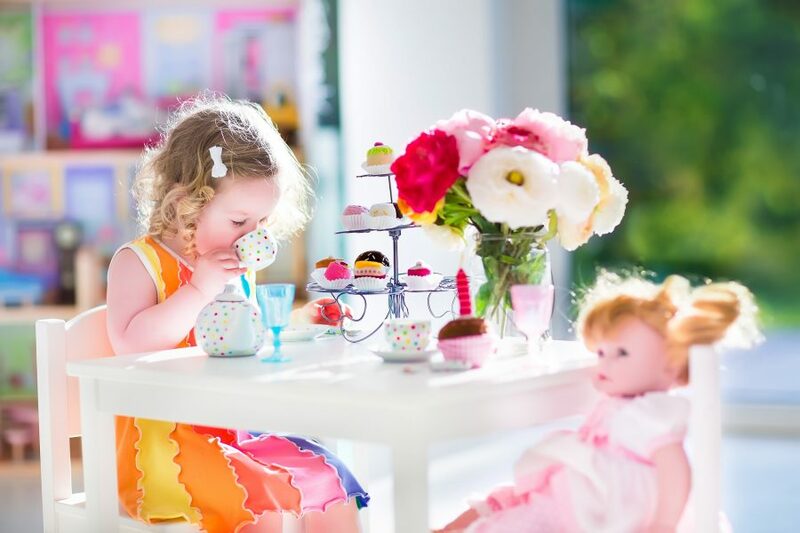 Modern tea parties make great birthdays for little girls who love to dress up. And many adults enjoy a Victorian themed party with big hats, lace dresses, and pinstripe suits. Make your tea party more fun with one of our tea party games. 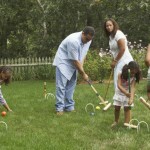 We have traditional games and some new options for adults and kids. Whether your party is an afternoon hour of relaxation, a “high” tea, or a birthday party, we have the perfect game for you. Hosting an adult tea party is a refreshing way to entertain friends. The following games will help your guests enjoy the party. Just make sure you leave some time for relaxing conversation over your cups of tea. Use saucers or demitasse cups for this fun tea party game. Provide each guest with a pencil and piece of paper. Place a loose-leaf tea on each saucer or pour a different tea into each cup. Let the guests guess what they are by how they smell and look. Provide a list of tea names and pass the saucers or cups so guests can match the each cup to the correct name. The guest who properly identifies the most teas is the winner. To make the game a bit more difficult, choose teas of all one color, such as white, black, or green. You will need a kitchen timer for this tea party game. Provide your guests with paper and a pencil or pen. Set the timer for two minutes and have your guests write down as many words as possible that start with the letter T or have the letters t, e, and a in them. No proper nouns are allowed. Give one point for each word that begins with the letter tea, and two points for words with tea in them. Total the points when the timer goes off and the player with the most points wins. This tea-time game takes a bit of preparation, but provides at least thirty minutes of play time. Before your tea party, write tea-themed words on note cards or slips of paper. Divide your guests into teams of three or four. Break open some cheap teabags and put the contents into plastic, lidded containers, one for each team. One team member draws a card and makes a picture with tea leaves on the table top. Their team tries to guess the word. The drawer cannot talk. Teams take turns, with the team getting the most correct answers with the shortest times winning the game. Hint: Try out the words you choose before the party. Have some that are easy and some that are more difficult. You will need between ten and fifteen brown paper lunch bags for this game. Place a different item in each bag. Choose objects that have different weights and density, such as a kitchen sponge, orange, fork, or toy car. Have your guests sit in a circle and pass the bags once with the guests guessing what is inside each bag. Have them write down what they think is in the bag on a piece of paper. Pass the bags again and have your guests reach inside without looking and make another guess. It will be fun to see how close to correct they were the first time. If you wish, you can give a small prize to those who guessed correctly the first time the bags were passed. Another game that keeps your guests entertained for a while is this special tea party bingo game. Before the party, use cardstock to cut out a large teapot shape for each guest. Mark off a grid of twenty five square, five vertical and five horizontal. Write tea party related words in each square, such as teapot, tea bag, sugar, cream, teaspoon, etc. Provide small candies to cover the squares as play progresses. Provide each guest a piece of paper, a colored maker, and a bandana or stripe of cloth to use as a blindfold. The goal is to draw a teapot without looking. Give your guests three minutes to draw and then see which picture most closely resembles a teapot. Provide a prize for the best drawing. Little girls love dressing up and playing grown up. 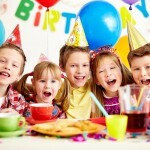 A tea party is a perfect afternoon get-together or birthday celebration. It may be difficult to get boys to participate, but a tea party is an excellent way to learn some manners. 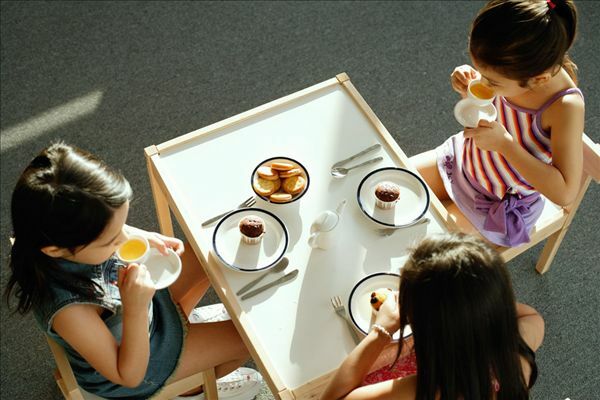 Try a themed tea party, such as “A Day at the Races.” Cater to the kids’ tastes with mini pizzas and little sausages wrapped in biscuits instead of the usual dainty pastries and finger sandwiches. 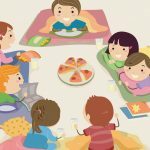 Add to the fun with our collection of tea party games for kids. A game that works well at the beginning of a kid’s tea party, place a tea bag and a small wrapped candy in small net bags. Hide the tea bags throughout a designated area of the house and have the guests find them. Whoever finds the most wins a small prize. Then divide the bags between the guests for their first cup of tea. Kids love musical chairs. Seat the kids in a circle in chairs and start some music. Choose some that fits with the theme of your party. Every time you stop the music, the kids must take a seat. Take a chair away after each round and whoever cannot sit down is out. Another way to play is to have enough chairs, but the last person who sits down is out. As the kids are sitting at the table drinking tea is a good time to play this game. One person tries to get everyone else to laugh or smile. They can tell a joke, make silly faces, or laugh themselves, but they cannot touch anyone else. Each player has two minutes to get the others to laugh. Use two teapots for this fun and challenging relay race. Depending on the age and composition of the group, you may wish to use plastic teapots or small plastic sand buckets. Each team attempts to fill the teapot or bucket with water in a tea cup. Consider using small plastic cups if your group his high energy. The first team to fill the teapot or bucket wins the relay race. For this race, your teams must transport a sugar cube on a spoon. If the sugar cube falls, the player who dropped it must return to the starting line and begin again. The first team to have all of its members complete the race wins. This relay race works best for older children. Set up a table or standing tray for each team at one end of a designated playing area with a teapot, cups, and saucers. At the other end, have a table for each team with chairs for each team member. Use a whistle to start the relay race. Team members sit at the table and must run to the table with the teapot, cups, and saucers, fill a cup, place it on the saucer, and run to back to the first table and sit down. The players take turns and the first team to have all their players seated with a cup of tea wins this relay race. Each team is given an empty tray. Team members must run from the starting line to a pile of items related to a tea party. Each team member picks up one item, places it on the tray, and runs back to the starting line. Eventually, all of the items are on the tray, and the race becomes very challenging! The first team to fill their tray and finish the race wins. Most kids have played Freeze Dance before. Additionally, many kids know the song, “I’m a Little Teapot,” which is perfect for a Freeze Dance game at a tea party. As the music plays, the kids dance to the song, using the motions, and when it stops, they freeze in place. You may need to run through the song for those who do not know the motions. If someone keeps moving or leaves their position, they are out of the game. Keep playing until only one player remains – the winner. Simply draw a saucer on a piece of poster board and cut out and color tea cup shapes, one for each guest. Each guest takes turns attempting to pin the cup to the saucer while blindfolded. The one who gets their cup the closest to the center of the saucer wins. A game that tests the concentration and memory of players, you need a colorful teapot to hide in plain sight. After everyone looks at the teapot, have them leave the room. Find a place to put the teapot where it is not obvious, but can be seen. Instruct the players to not say anything when they spot the teapot, but sit down at the table for a cup of tea. The last player to see the teapot hides another item, such as a sugar bowl, tea cup, or saucer. Remember to have colorful table clothes, napkins, and add some fresh or artificial flowers (if guests have allergies). Decorations do not need to bed expensive. Check out what is available at your local discount or dollar store, also an excellent place to find favors and prizes. You do not need to serve a meal at your tea party, but some small snacks are appropriate. For your adult party, try petit fours, small bite-sized confectioneries, and cucumber sandwiches, both traditional tea party treats. Cut the crusts off the bread for the sandwiches and use cookie cutters to create designs such as diamonds, circles, and triangles. Consider iced tea or lemonade for those who prefer cold drinks. Kids will like salty snacks and candies. Don’t forget those soft mint candies in bowls and mixed nuts, also traditional tea party fare. Keep your favors and prizes simple. Consider bookmarks, a tea cup, bundled tea bags, sample size cosmetics and scents, small notebooks, keychains (for adults), and coin purses. Although you do not need to give prizes for games, doing so adds to the fun. Consider a bag to give each guest as they leave with a sweet treat, tea bag, and one or two other small items. Our tea party games and ideas are both traditional and original. You may be planning a traditional high tea, a Victoria reenactment for couples, or a birthday party for your twelve-year-old daughter. 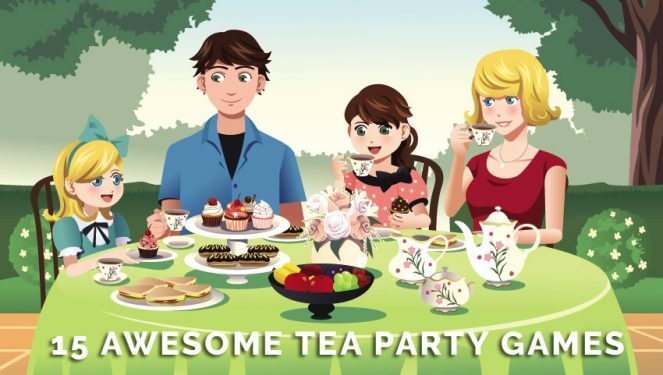 Whether your group is composed of your lady friends, couples, or kids, we have a game for your special tea party occasion. 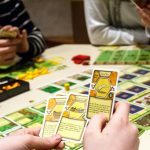 Pour the tea, play a game, and have fun!